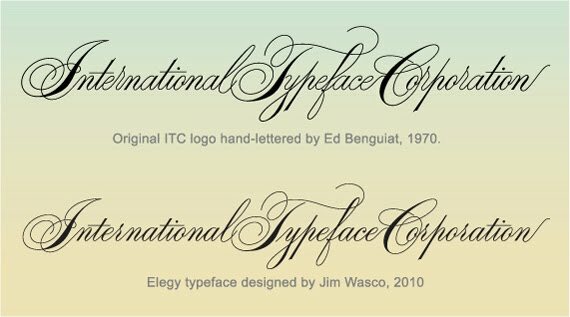 I love script fonts that read well and have always admired the original International Typeface Corporation's hand-lettered logo of Ed Benguiat's design from 1970. 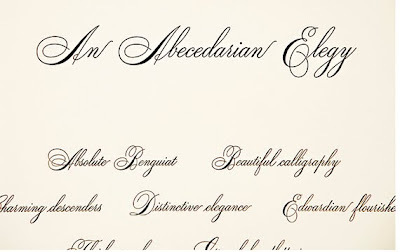 It has beautiful capitals with lovely flourishes and word spacing accompanied by smartly designed ligatures and lowercase letters. 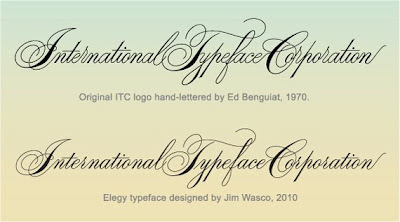 Forty years later, it has now been beautifully transformed by type designer, Jim Wasco into the OpenType font, Elegy. Named so, as a tribute to Aaron Burns, the original director of ITC who was a driving force in the early days of the company. 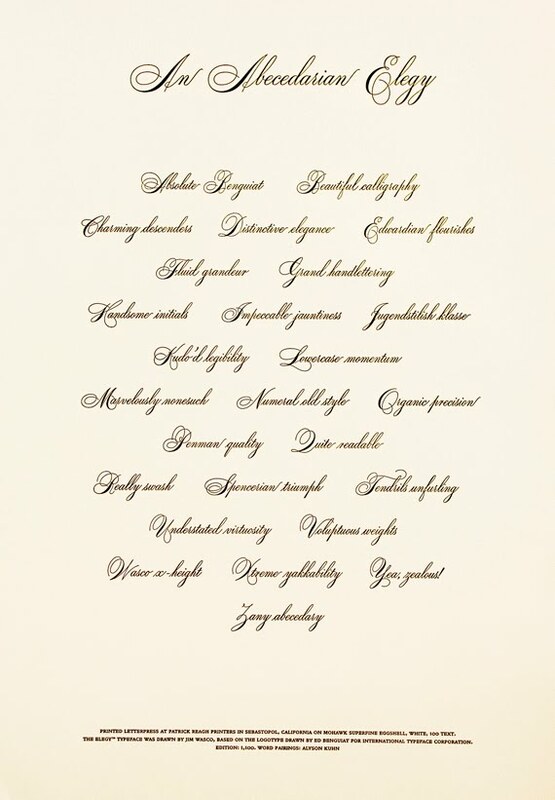 (Burns also authored the book, Typography in 1961 which I highly recommend. You can still find it on used book sites). Because of Elegy's fine hairline strokes and nuanced qualitites, it performs best above 18pt, according to ITC's website. The limited-edition broadside celebrating the release of Elegy was commissioned to Patrick Reagh Printers and is printed in 70pt text on Mohawk Superfine. Patrick Reagh is a good friend I met a lifetime ago in Los Angeles when he did some printing for me at the time. He was a very skilled pressman and typographer even then, and continues to produce some of the most elegantly designed books for prestigious libraries, institutions and private patrons in California. He now lives and works in lovely Sebastopol CA where he is a printer/farmer with a barn full of metal type, presses and a rich archive of work to his name. His printed Elegy broadside was actually written by another old friend and clever wordsmith, Alyson Kuhn, who writes witty and newsworthy posts on the wonderful Felt and Wire blog. 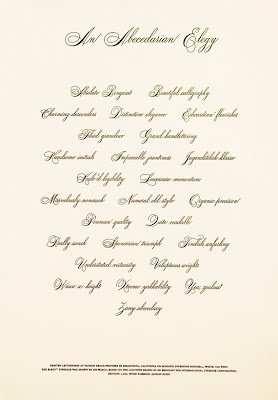 And Ilene Strizver of The Type Studio (who I don't know, but wish I did) typeset this delightful work. Those lucky souls attending the upcoming TypeCon 2010 in Los Angeles will each receive a copy of this work. Kudos to all!